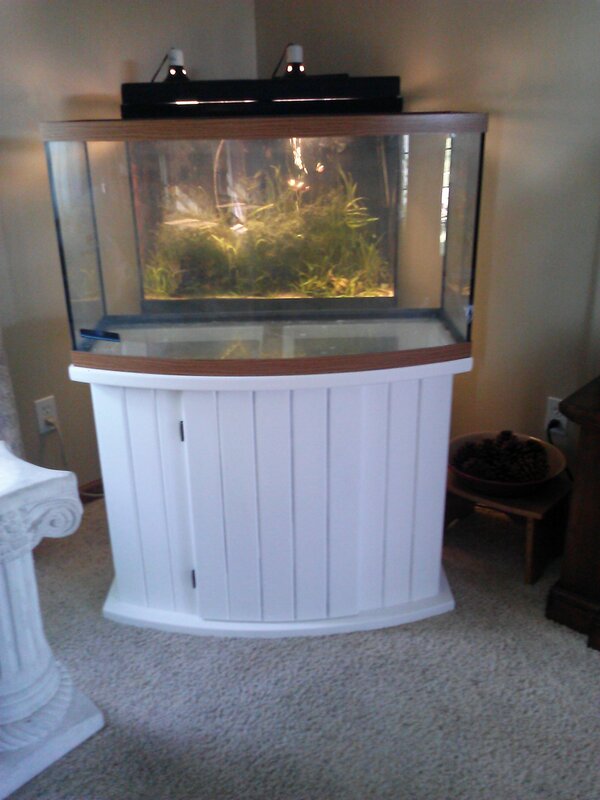 Another tank! Bigger is better. 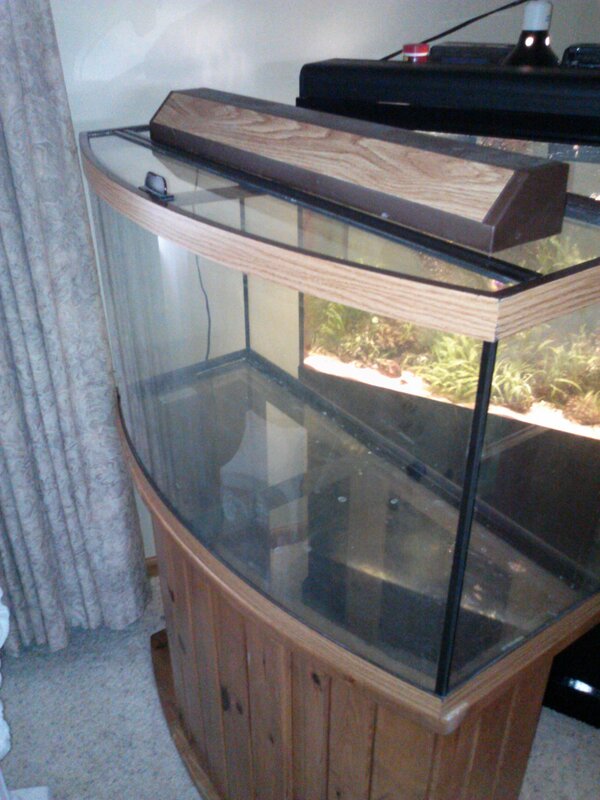 I bought a used 42-gallon glass bowfront tank for my Saltwater fish. 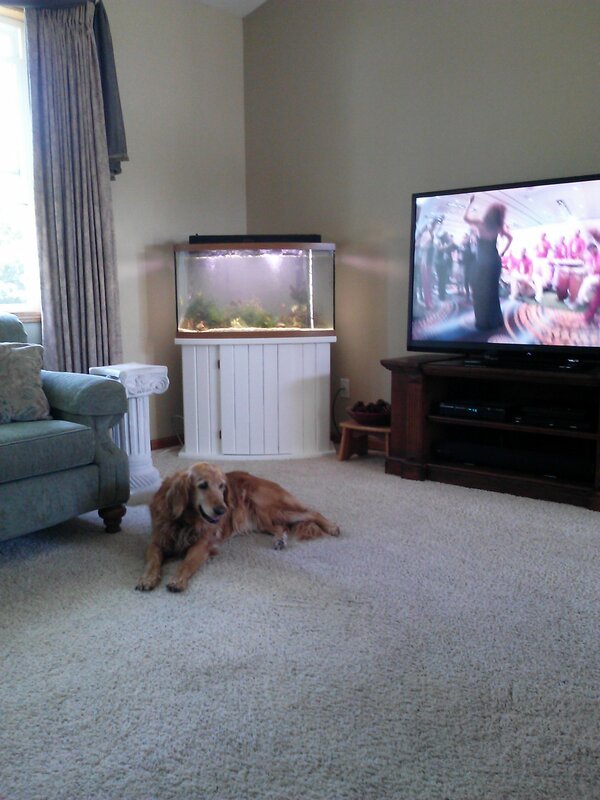 I set the tank in front of the old one, trying to see how it would look. The stand is nice but it was nicked-up and it was too much wood for our living room. 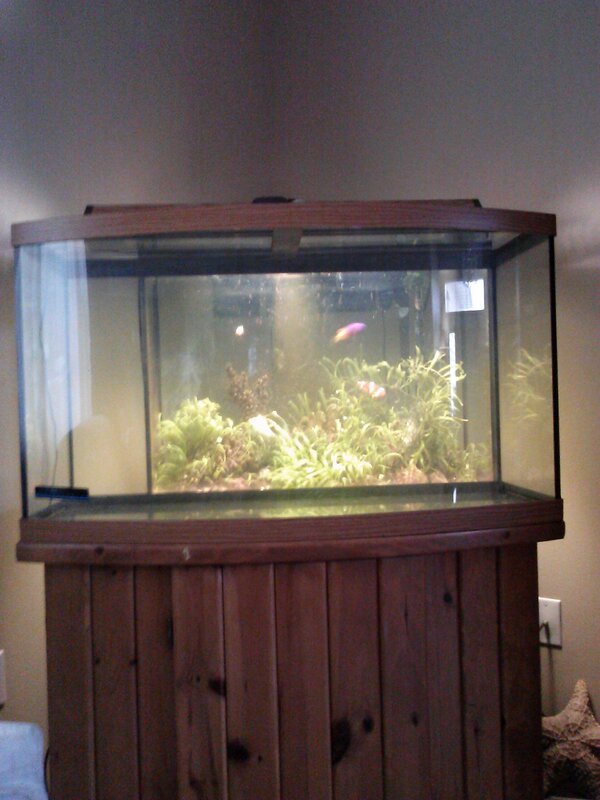 The old tank was 37 gallons. 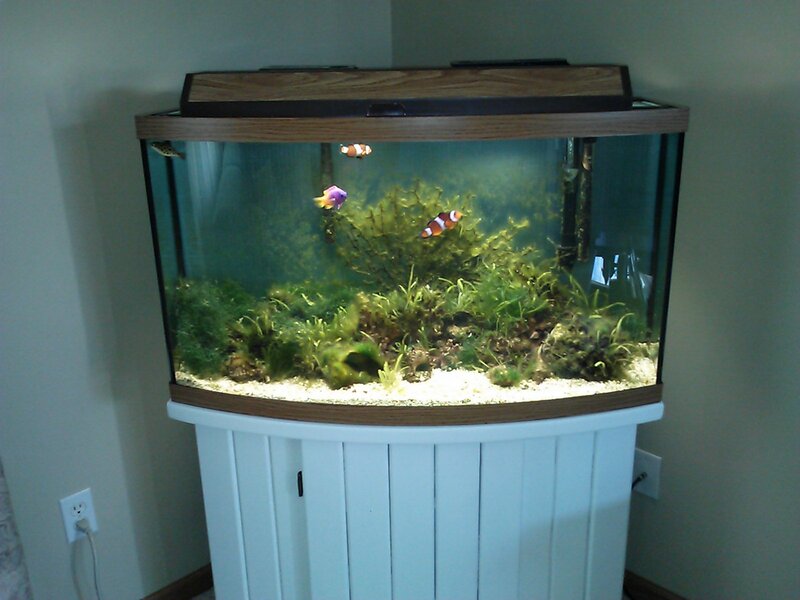 This tank has more “floor-space” which is most useful to fish instead of height. So I went to work….OK OK a little lie there…my wife went to work. 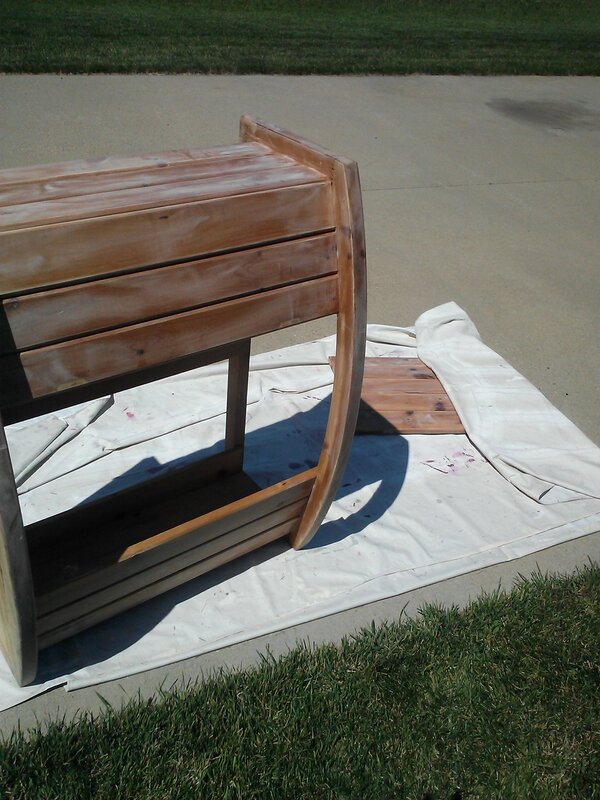 She is very talented when it comes to painting and refinishing. 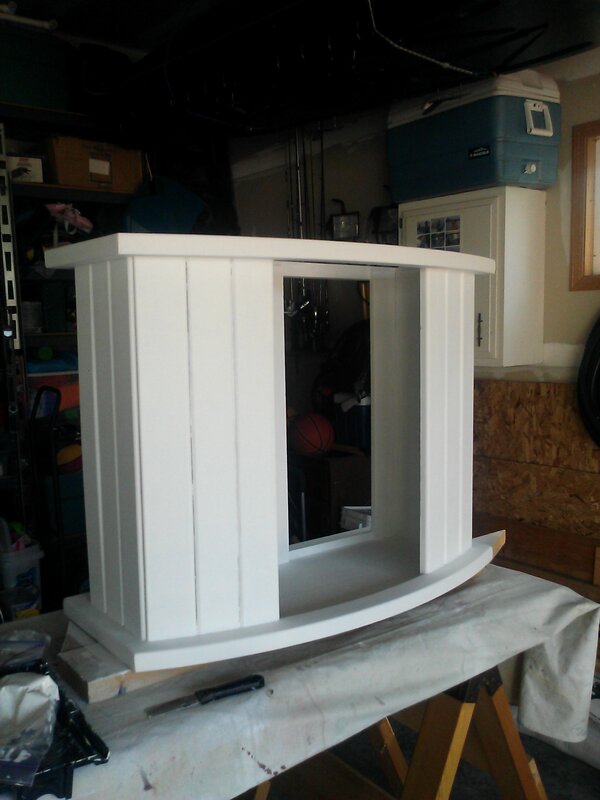 First she sanded the stand. 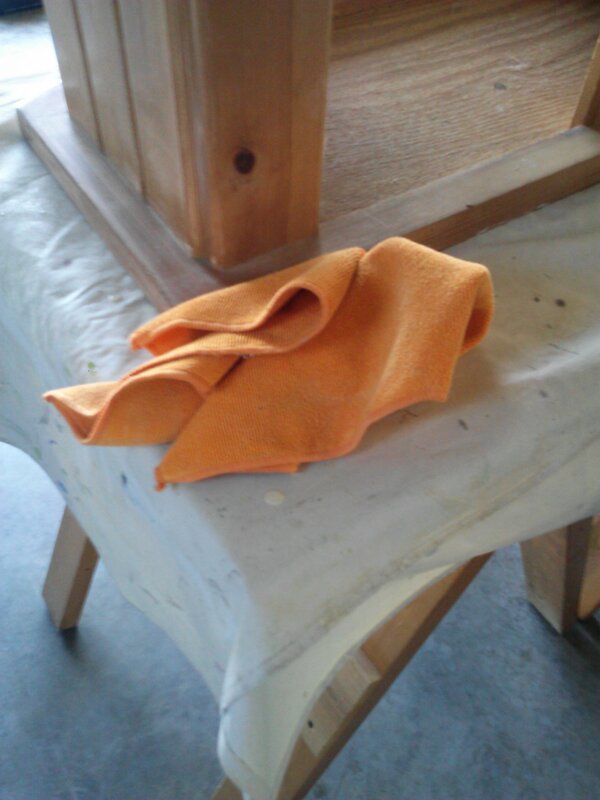 And painted it. Now this makes it look easy, but she spends a lot of time and makes it perfect. Cloudy water for one day. …I mean , my wife made the background. Jeesh, what is this, the Spanish Inquisition? 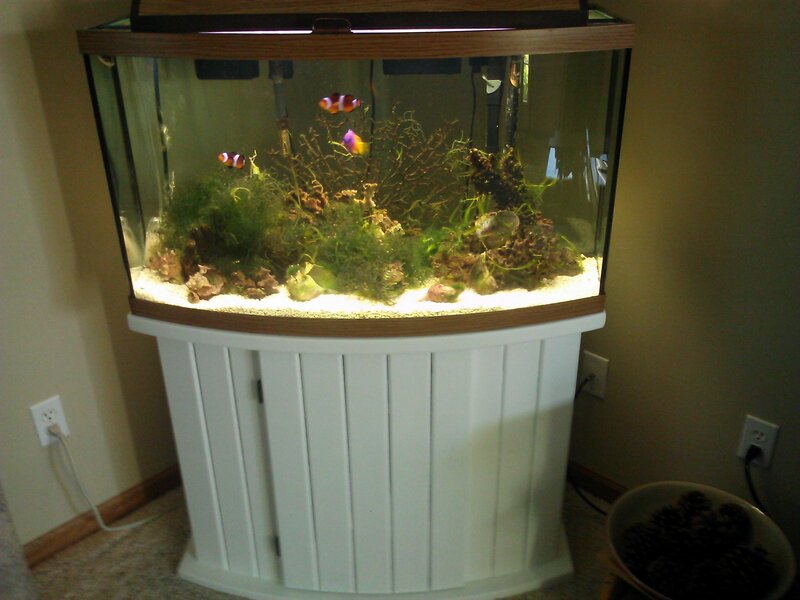 In a few months I will have had my 2 Clownfish and one Royal Gramma for 6 years! A Green-Spotted Puffer lives with them, too. Water Sprite takes over the world! 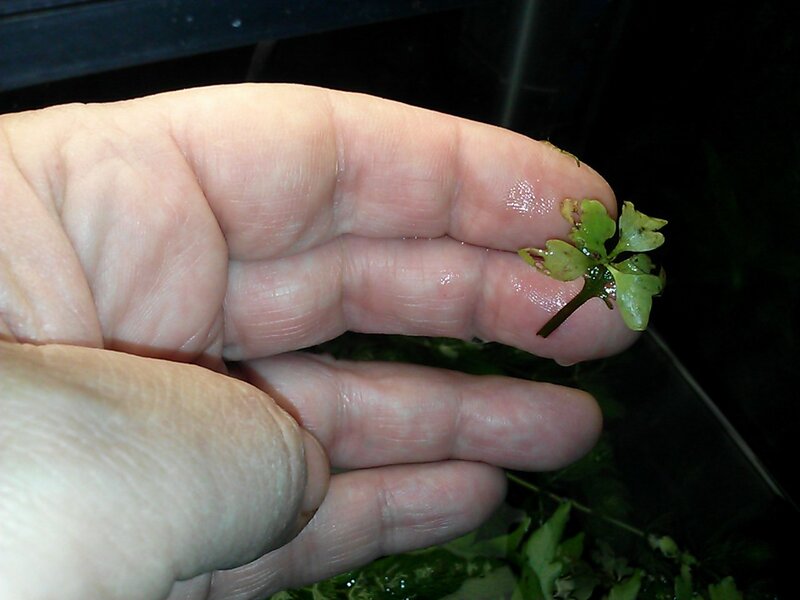 A few months ago I found a thumbnail-sized plant floating in one of my aquariums. I still don’t know where it came from, I hadn’t bought any plants for a long time. 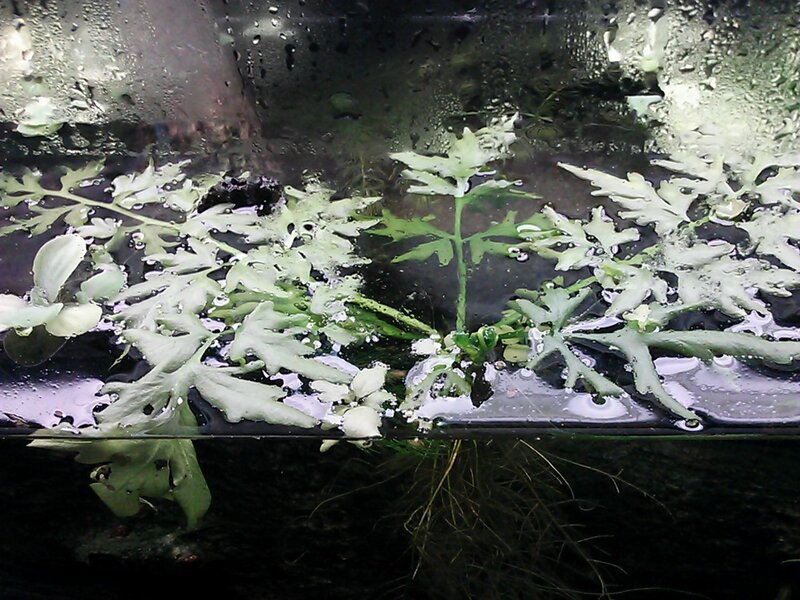 It was a little Water Sprite plant. I hoped it would grow, expecting it to get maybe 3 or 4 inches across. 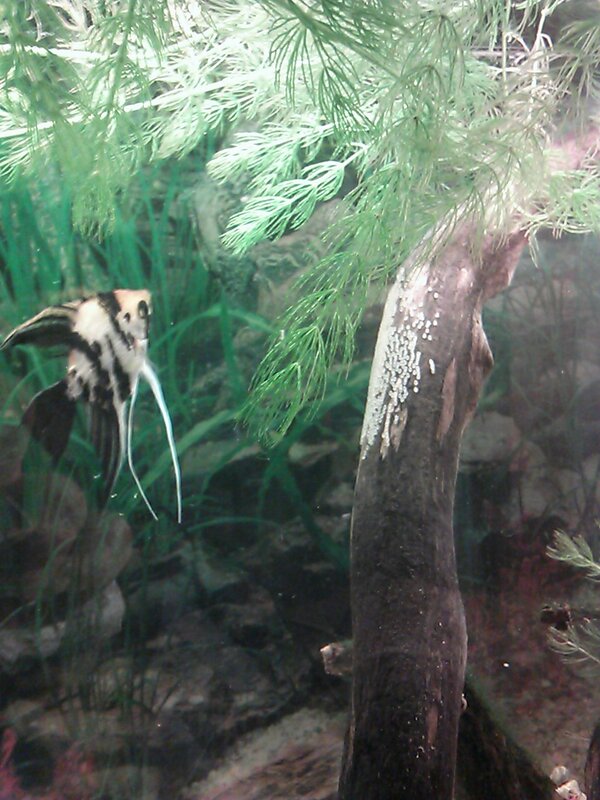 Eventually, it started reaching out of the aquarium. 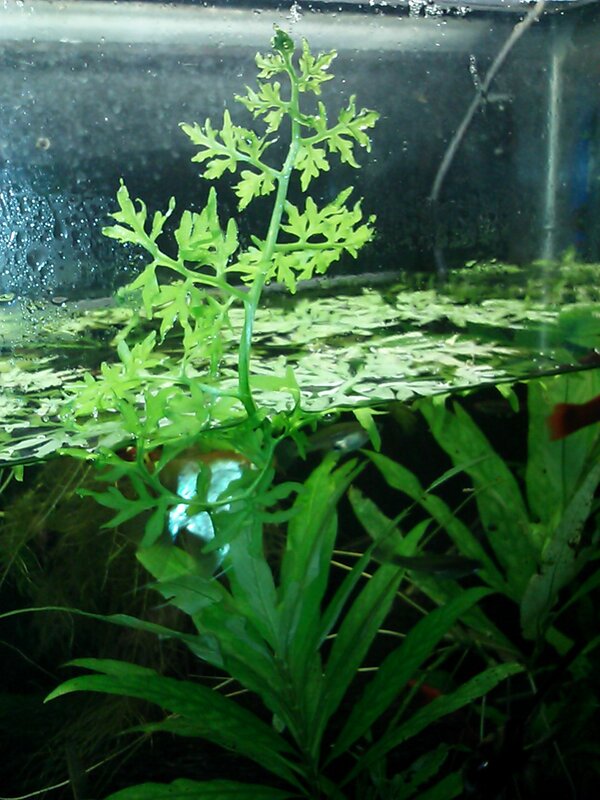 It’s leaves take a different fern-like form when they are above water. This thing is crawling out to get me! Help!!!! 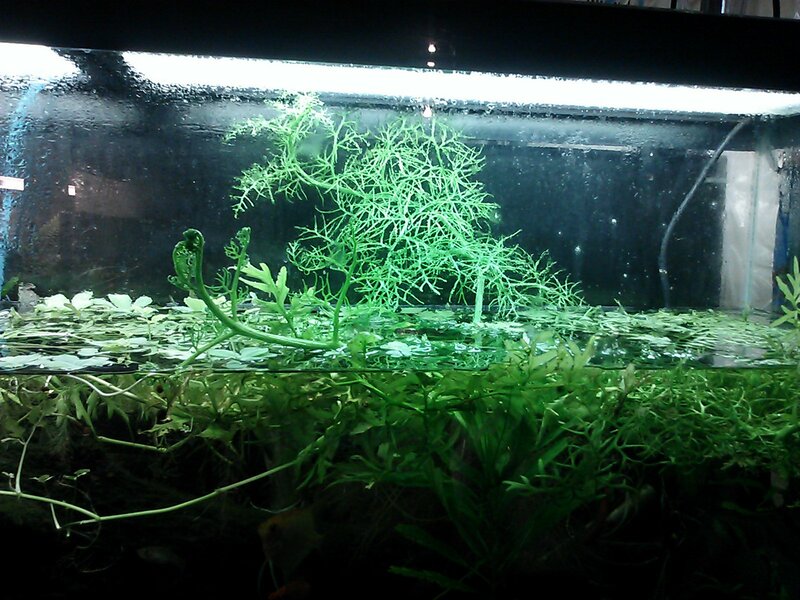 The main plant covers half of a 55 gallon tank. 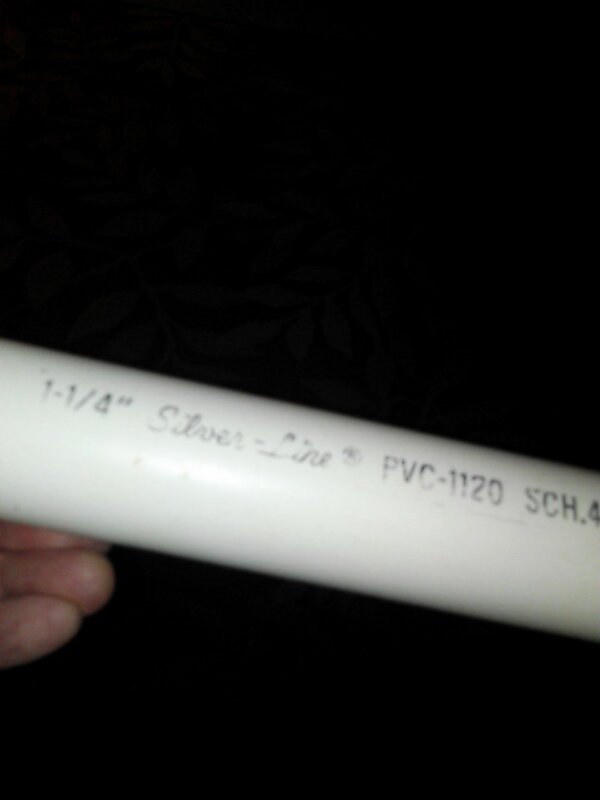 It’s 24 inches across!! 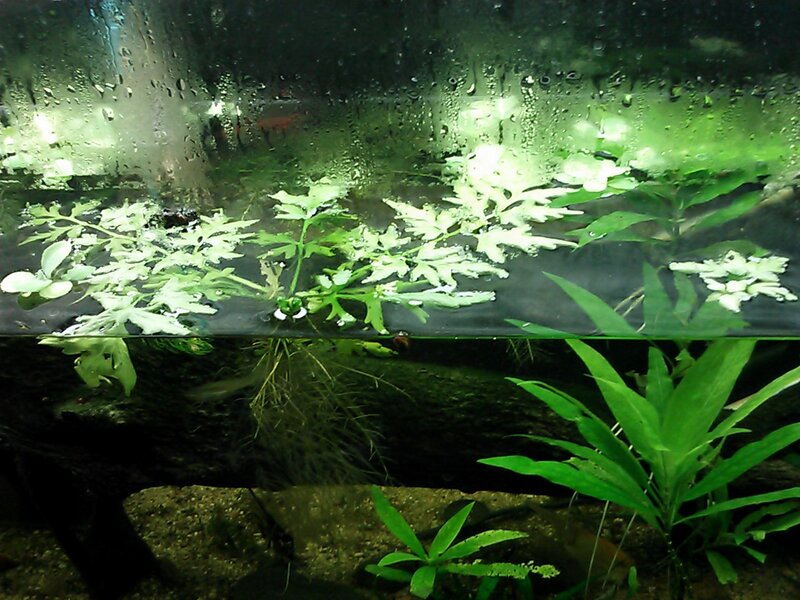 Also, the plant forms baby plants along the big stems and I have many Water Sprite plants now and have given some away. The Water Sprite can float or be be planted in the gravel. It’s leaves are soft and the snails will eat some of it. 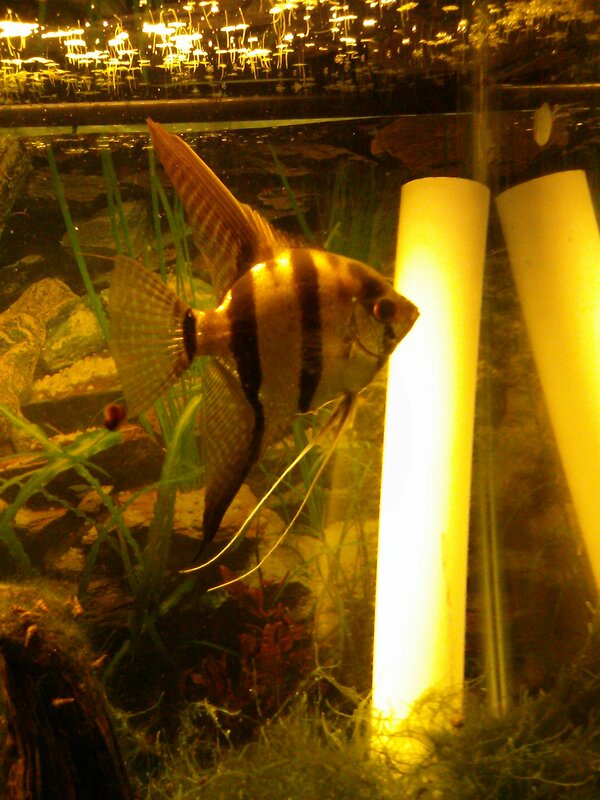 I crush the snails and that makes my Angelfish and Swordtails very happy. If you look up Water Sprite on the Internet you will mainly see reference to a fine-leaved variety of plant called Ceratopteris thalictroides. 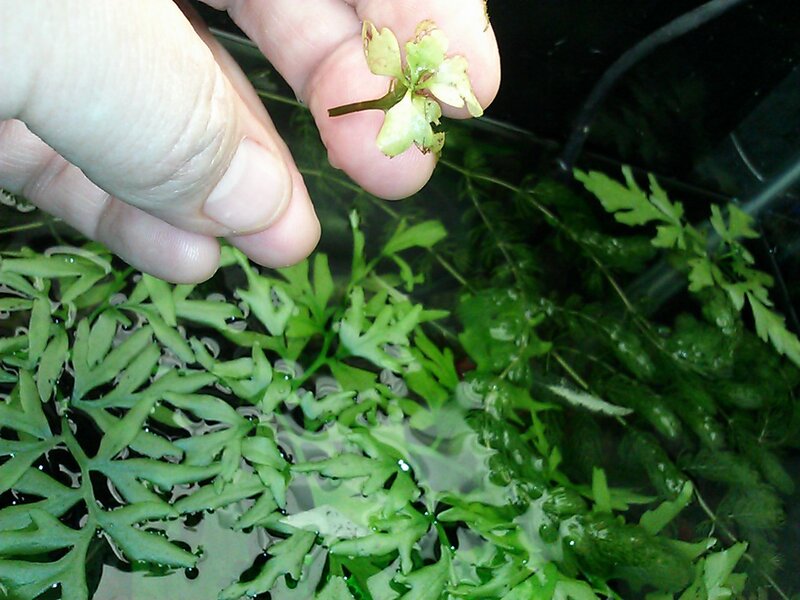 I believe my plant, I mean PLANTS, are Ceratopteris cornuta, which is the broad-leafed Water Sprite, even though it sounds like a dinosaur. 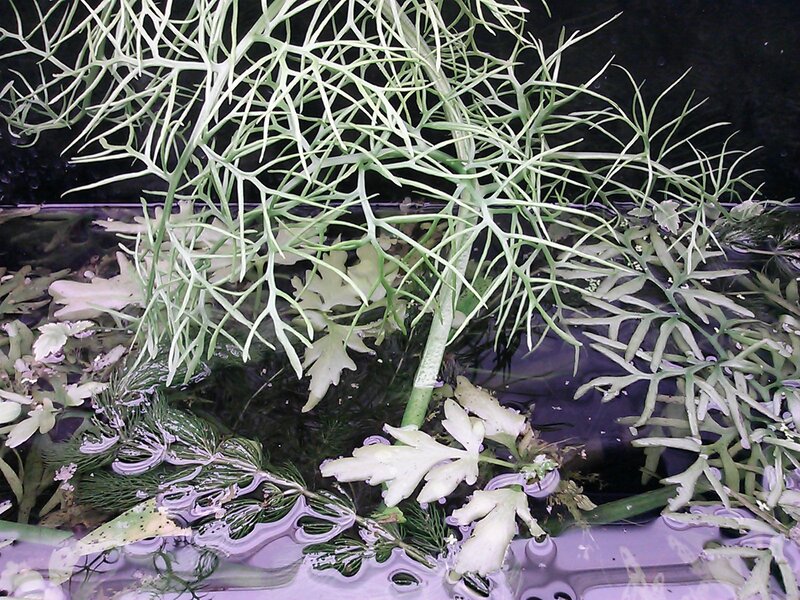 I think both varieties of Water Sprite take the same care: Water, light, fish poop. 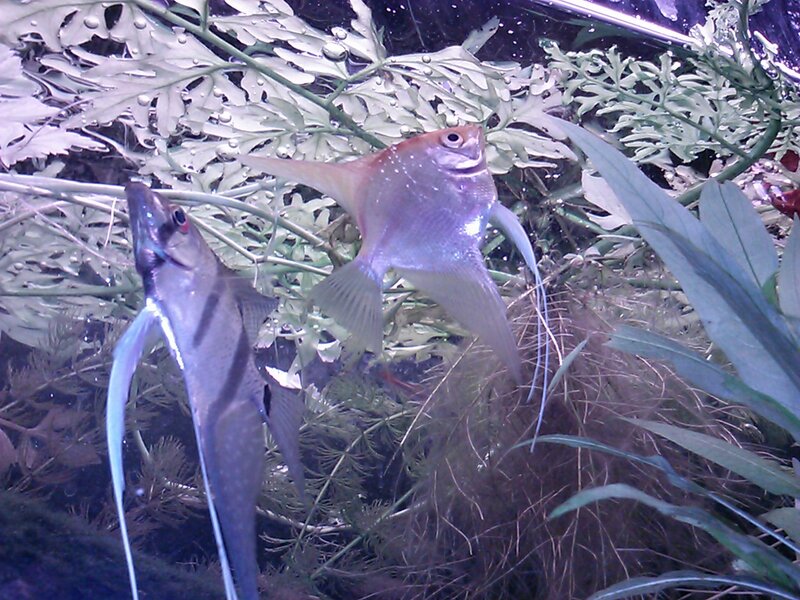 Pieces of flat slate rock have been the standard surface to use when spawning Angelfish. 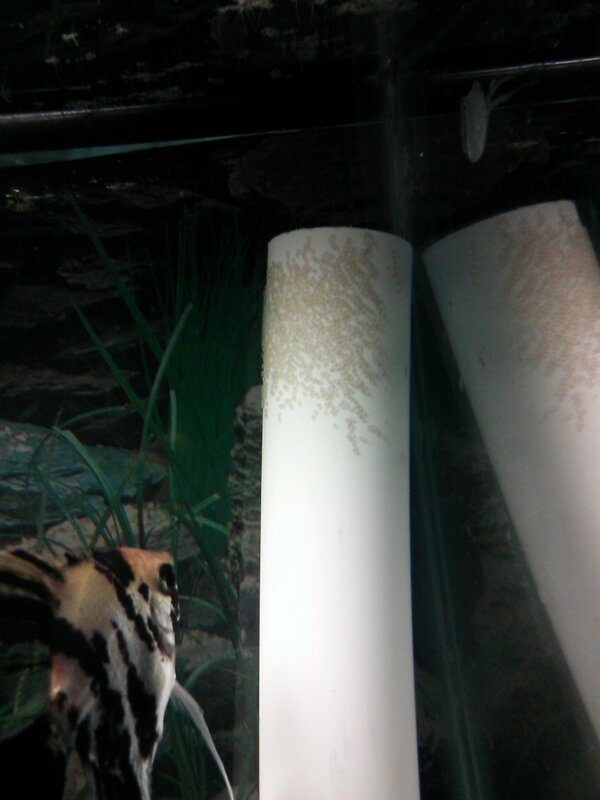 I came across some short pieces of PVC pipe and, as you can see, my Angelfish pair laid their eggs on it. 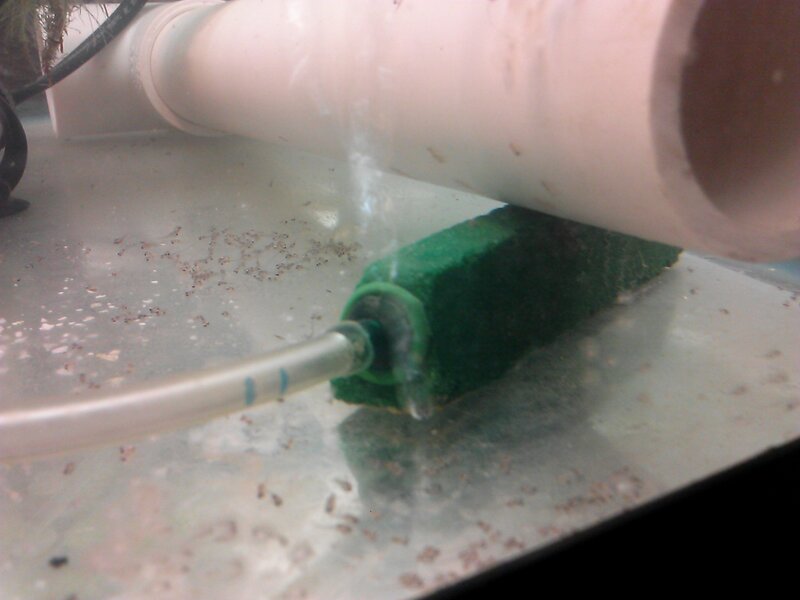 It only took about 2 days for them to become very interested in the PVC as a spawning site. Place it at an Angel, I mean angle, like you see in the photo. At first I gave this pair the opportunity to raise the babies, but that didn’t work. 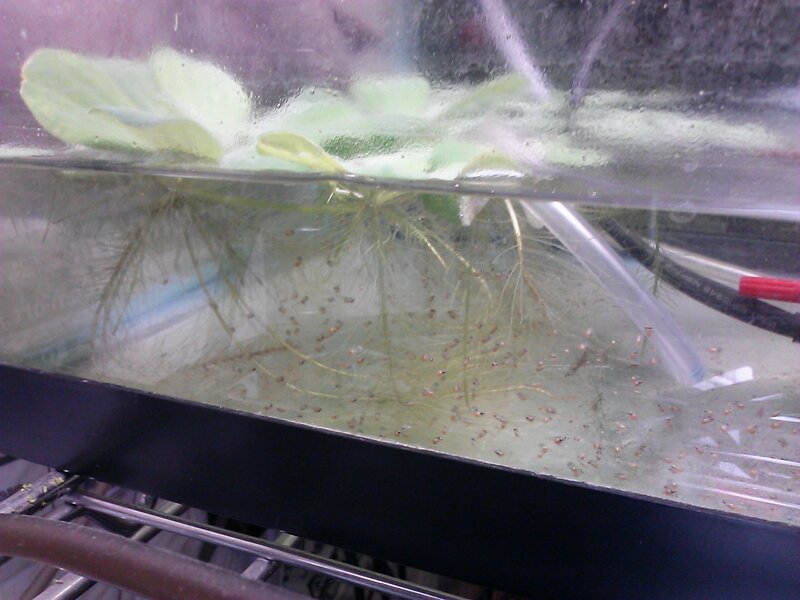 The next time they spawned I removed the eggs and PVC and laid it on it’s side in a shallow tank with a heater and aeration. 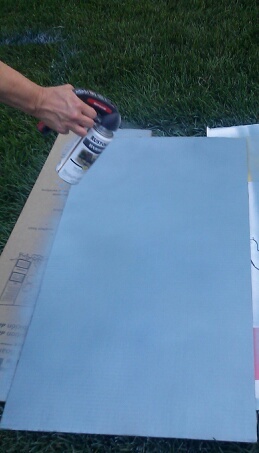 Then I added Hydrogen Peroxide drops as an anti-fungal agent. I used about 3 milliliters per 2 gallons. 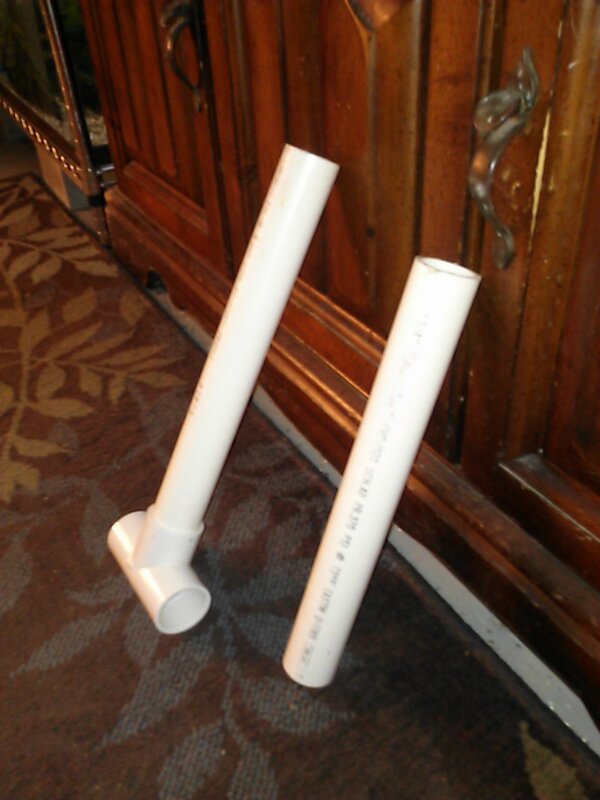 As you can see, I also attached a”T” piece of PVC to the tube to prevent the PVC from rolling on it’s side and crushing the eggs and babies. 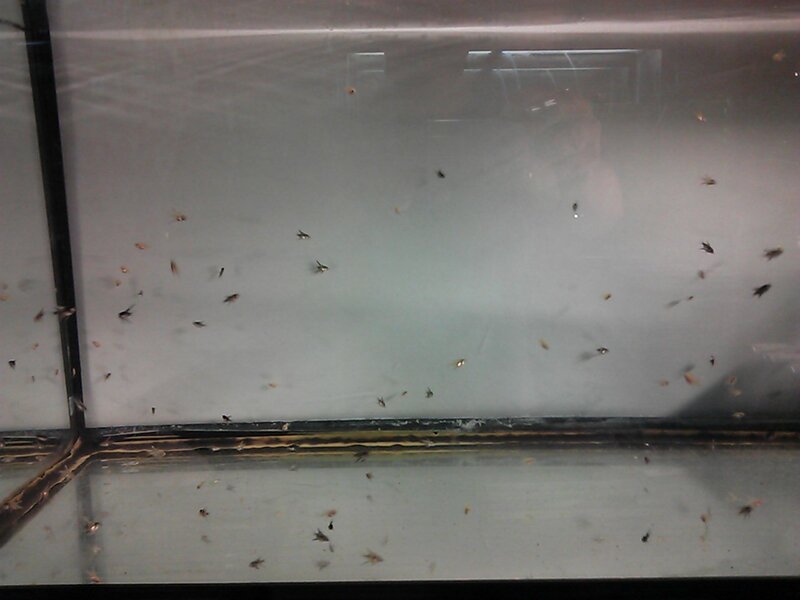 The babies hatch and spend a few days on the bottom of the tank. 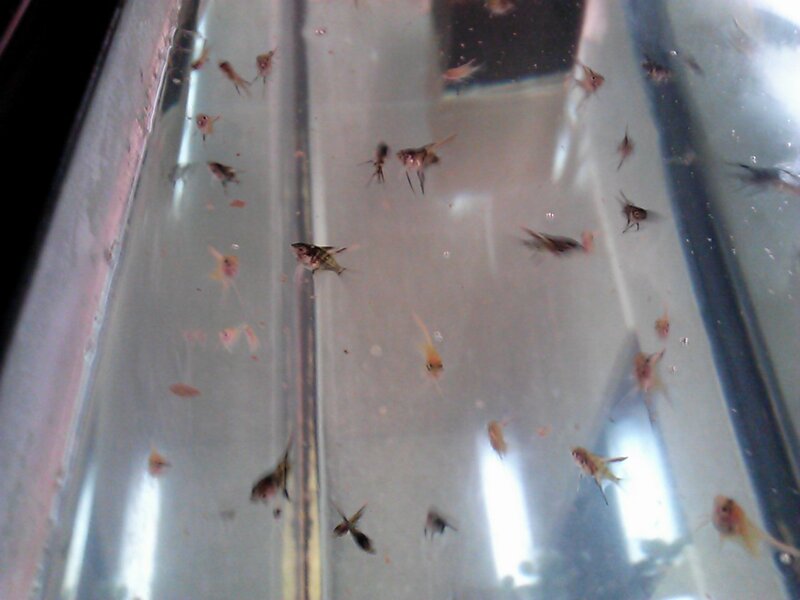 The baby Angles, I mean Angels, grew fast on baby Brine Shrimp and Banana Worms. Now they are eating crushed flake food as well. I have been using Earthworm flakes because it’s a high-protein food. 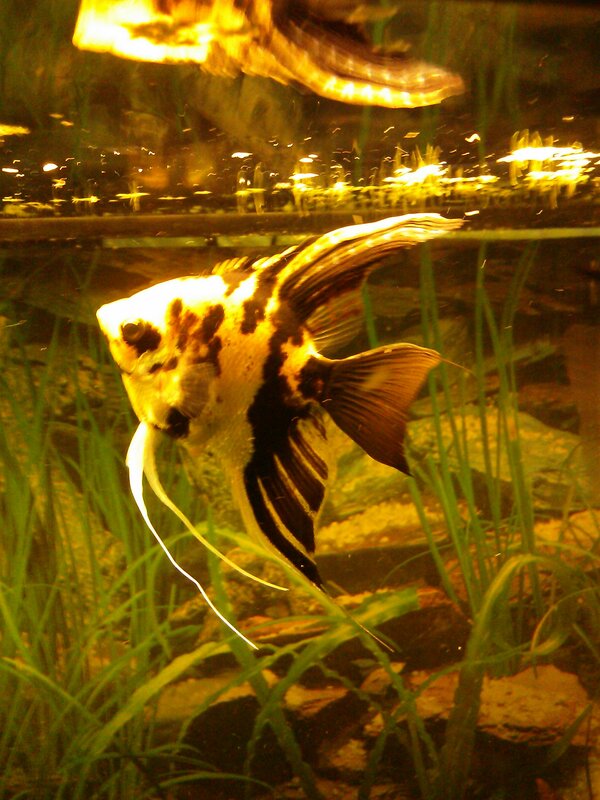 Angels will lay their eggs wherever they can, but using a flat rock or PVC allows you to remove it and raise the babies. A sturdy plastic plant with big leaves makes a good site, too. I have seen Angel eggs on heater tubes and the side of the aquarium. Eggs laid on a branch.